Thank you for your purchase from Shoe Mill on Amazon! Shoe Mill is a third party seller on the Amazon site. ShoeMill.com website for Shoe Mill. Shoe Mill is a family owned business with 7 physical locations in Portland and Salem. Click Here to learn more about our store locations. 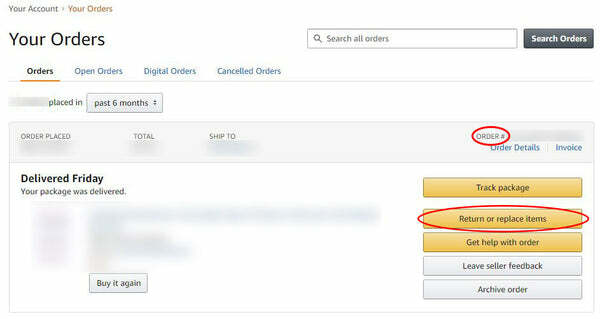 You will need to access your order history from your Amazon account. You will need to do so by accessing your amazon account. The images below should help guide you through that process. Amazon does not allow for exchanges within the system. The simplest way to handle exchanges is to return the item and re-buy the new size. We recommend this process, and encourage the use of the discount code included with your shipment for the second purchase and any purchase within the expiration date of the code. Discount code is only valid on ShoeMill.com. If the product is defective, please email a photo of the defect to our seller profile and include your order number. Defective merchandise is verified by Shoe Mill and returned at Shoe Mill's expense.